It all started with this pouch. Is that not the cutest sassy little nurse you've ever seen? On the greatest fabrics ever? Who can resist dots paired with stripes? Not me. And robin's egg blue with chocolate brown and mojito green (okay, I've never actually had or seen a mojito, but I associate them with this color). 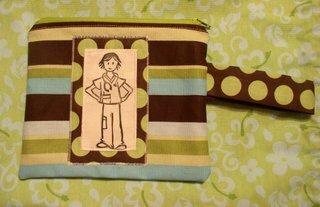 A very good friend of mine is a nurse, and her birthday is this month, so when Regina blogged about the zipper pouch back in February, I boldly wrote to her and asked if I could barter with her, and get that pouch for my friend (damn, do I really have to give it away?). Of course, being the kind, generous, creative soul that she is, she said yes! But look. Just look what I got along with that pouch, for me and my girls! ... like these adorable stamped notecards with matching envelopes. I think the illustration itself is wonderful, and the fact that Regina carved the stamps herself? Utterly amazing. I wish I could take better photos, because these pictures don't do justice to her workmanship, but whatever. I couldn't wait for natural light, I couldn't be bothered to set things up any better. I was just too excited to show it all off! And to say thank you thank you thank you! 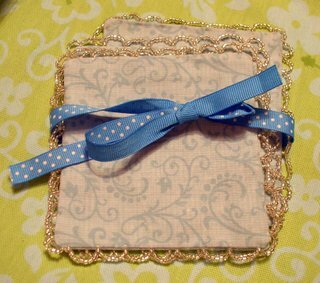 Look at these gorgeous sewn and beaded coasters. Four of them! I do not own glasses nice enough to place on top of these, but I pet them once in a while, and maybe I'll break down and put my "regular" glasses on them, just because I want to look at them all the time, every day. The beads glimmer and they make me and my Fancy Nancy daughter smile. Oh, and Regina, you didn't seriously think I was going to let my kiddos get their paws on these, did you? 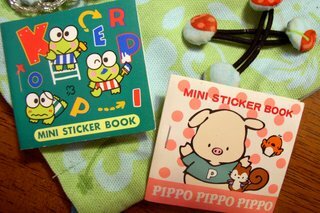 There's no way you could have known, because I'd even forgotten about it myself, but I coveted these when I was in elementary school. I'd save up and get them at the Hallmark store and never ever entertain the notion of touching or removing a single one of the stickers in the books. I must still have those Hello Kitty and Little Twin Stars booklets somewhere... Anyway, I digress. Rebecca would have my walls peppered with those stickers in ten seconds flat. No way is she going near these! Gosh. I'm gushing, I know, but I am being entirely sincere with every word I type. To me, this package represents a friendship that has developed through blogs, comments and emails, and it just completely warms me, for lack of a better expression. Thank you, Regina, thank you so much. What a great package! The zippered pouch is terrific and everything else is, too. Wow, how lovely. 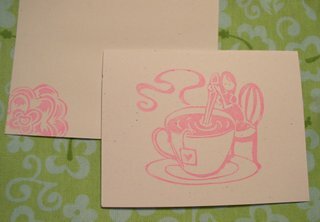 I got one of those cards from Regina's card swap--I did not know the stamp was hand carved! score-a-rama!! Regina completely spoiled you! How fun! I think I am going to have to get in on a swap someday. 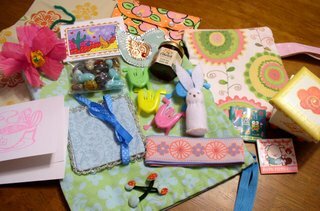 I do soap swaps every year at Christmas but a craft swap looks like too much fun! !